The statement above, from Sebastian Junger’s book, “Tribe”, describes part of what some of us gain from RNA. It enables us to gather with others who share some similar views, and to learn and explore and draw from whatever pieces we want – each in our own time and in our own ways. One form, for me, has been the ReligiousNaturalism.org website. After it being static (and neglected) for a while, a resolution for the new year is to highlight new topics every week or two and, over the course of a year, to give a survey, from one perspective, of challenges, practices, and resources that can be parts of a RN orientation. A number of RNA members have described approaches they use to express or explore or act upon RN-related themes, ranging from music and art to hiking, reading, gardening, teaching, social activism, websites, and many other things. After describing and providing links to several of these via the RNA Members’ Projects page, another resolution for the new year is to build on this and, for those who so choose, to expand awareness of what members are up to and interested in and make it easier to communicate and share. Since there wasn’t a lot of “news” this month, I’ll leave it at that. 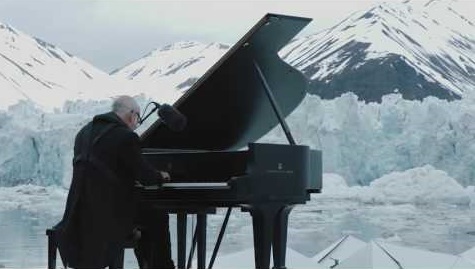 Also, because it’s beautiful and seems relevant, I’m sharing a link to a 3–minute video of Ludovico Einaudi, with piano on an iceflow (as in the photo above), playing Elegy for the Arctic. Best wishes to all for 2017. Click HERE for links to Advisor information. Copyright © 2019 Religious Naturalist Association. Powered by WordPress. Theme: Spacious by ThemeGrill.